The name holds such mystery and allure that trying to find the bird by that name is overwhelmed on Google Images by like-named Honda motorcycles, handguns, super-heroes and Lockheed fighter jets. And it turns out, the bird–for which the term originated–is not a hawk at all. But that is an honest mistake or intentional comparison if you see their sleek raptor-shaped fuselage and falcon-like wings or watch them dart in the dusk with such precision. But they could not eat an mouse if they wanted to, lacking the grasping talons of their namesakes or the curved flesh-ripping beaks. They eat insects on the wing, their thick necks ending in a wide-gaping mouth that works well for scooping up the same food that the bats–in the lower feeding tier closer to earth–are feasting on. This is a crummy picture. But it’s my picture. Had to see if I could snag one, almost dark and just when I was supposed to be shooting a shot of our friends’ 40th wedding anniversary cake on their deck. 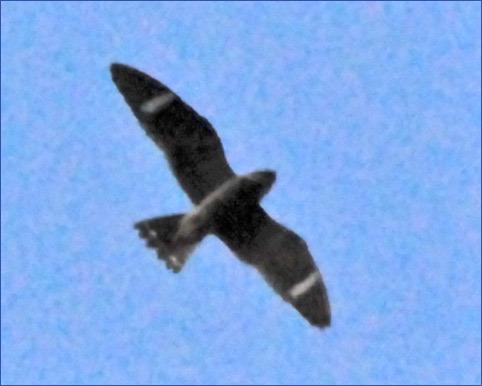 They live on a ridge, so the nighthawks we see from our valley flying more than 300 feet below above the top of our ridge were flying only 75 feet from that ridge top point of view. The 1600 ISO setting on the Nikon D200 gives unacceptable grain and color noise (though it adds a sort of X-files mystery to the image I think) but at least I got the shot and had fun shooting straight up and panning fast. Almost knocked myself arse over teakettle a couple of times. I wonder do swallows, nightjars, bats, inhale when they mouth their prey? Do they gulp like fish? Otherwise it just seems like they might be pushing a lot of air around with those big mouths and their prey with it. Lately we’ve seen birds flying very high, almost at nightfall, crisscrossing the sky as if feeding on insects. They had a jerky kind of motion, with quick reversals and little gliding, so I thought they were swallows. Could they have been nighthawks? In the picture above , the bird definitely seems to be soaring like a hawk. Next Next post: Rainy Monochrome Melancholy to Come?